In the United States the Federal Government regulates many aspects of labour relations. So for example it provides for a national minimum wage and anti-discrimination procedures. But over and above those Federal laws, each state also has the right to enact local laws that regulate employment. Any state could, for example, enact a minimum wage for the state that exceeds the national minimum wage. Although state labour law makes up only a fraction of American labour regulation, it is useful as a measure determining the differing degrees of state intervention between states. Citizens of states are free to move from state to state to find work. A composite point (denoted by the abbreviation “ERI” for Employment Regulation Index”) is allocated to each state on the basis of individual questions relating to sub-topics (an ERI of 100 denoting the conceivably most heavily regulated state employment market). The states are annually divided into three groups titled “Good”, “Fair” and “Poor”, each corresponding with the relative degree to which the labour regulation of each member of each group is conducive to job creation. “Applying standard statistical techniques, we found that, when the ERI is inserted as an explanatory variable, our models demonstrate that higher levels of regulation (i.e., higher ERI scores) result in both higher unemployment and lower rates of new business formation, and that the effect is statistically significant at standard confidence levels. Moreover, the magnitude of the estimated effects is substantial. We estimate that, if each state were to achieve a “perfect” score on the ERI, the effect would be equivalent to a one-time boost of approximately 746,000 net new jobs”. Alabama, Florida, Georgia, Idaho, Kansas, Mississippi, North Carolina, North Dakota, Oklahoma, South Carolina, South Dakota, Tennessee, Texas, Utah, Virginia. Alaska, Arizona, Arkansas, Colorado, Delaware, Indiana, Iowa, Kentucky, Louisiana, Maryland, Minnesota, Missouri, Nebraska, New Hampshire, New Mexico, Ohio, Rhode Island, Vermont, West Virginia, Wyoming. California, Connecticut, Hawaii, Illinois, Maine, Massachusetts, Michigan, Montana, Nevada, New Jersey, New York, Oregon, Pennsylvania, Washington, Wisconsin. Quite clearly it would pay a state to be in the “Good” group. The average employment creation in that group is on average 4.5 times bigger than what it is in the “Fair” group, and 5.5 times that in the “Poor” group. A more dramatic illustration of the value of low regulation is to compare the actual percentage of jobs created over the same five-year period by the “Good” group as opposed to the “Poor” group of states. The “Good” group’s employment growth was 4.4% over the period, compared to that of “Poor”, which was a measly 0.6%. In other words, the “Good” states proportionally created more than seven times as many jobs as the “Poor” states did. In actual numbers the “Good” states created 2 124 734 jobs (starting from about 47 million), while the “Poor” states created only 390 551 jobs (starting from a much larger 62 million). What is amazing about these figures is how big an impact a relatively small difference in regulation makes. Imagine the difference that could be achieved if the edifice of Federal labour legislation were to be dismantled as well! You cannot please everyone all the time, but I have to say it: Trade unions are not part of the solution to unemployment. They are a major part of the problem causing it. What I demonstrate in this article is that the higher the trade union density is in an industry or an economy, the slower the job growth in that industry or economy. 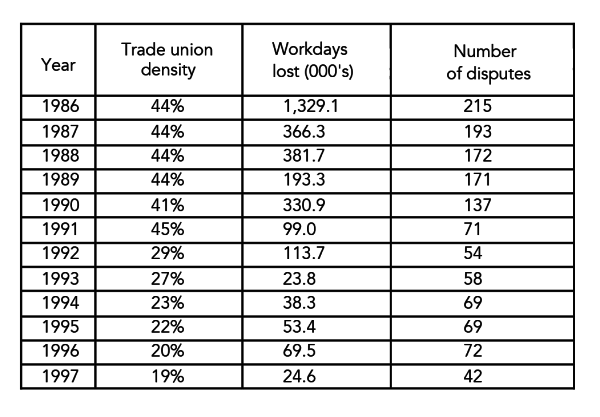 Trade union density is the number of trade union members expressed as a percentage of a particular industry, a particular country or even a particular business. It provides a very important indicator of the influence of trade unions in any unit measured. South African union density is very much a function of legislation. It was only after the introduction of the Labour Relations Act 1979, which extended legal protection for trade unions to black workers, that union membership in South Africa truly started escalating. Before that there were unprotected black trade unions for a minority of black workers, as well as some white trade unions. 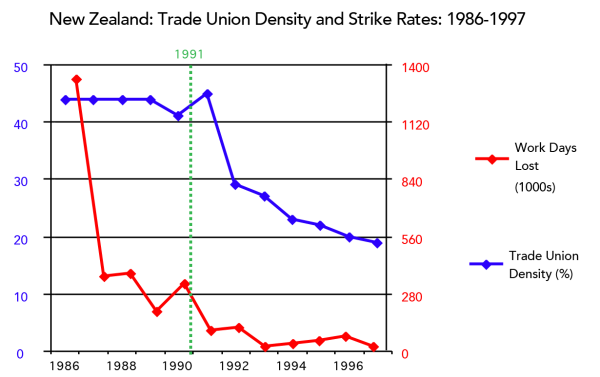 Pursuant to the new legislation in 1979, trade union membership escalated from a very low base of a few percentage points to a very high percentage. In Table 1, South African Union density is expressed as a percentage of the economically active population, to demonstrate the initial spurt of growth of this phenomenon which eventually came to dominate the economic scene in South Africa. From Table 1 it is clear that union density grew very steeply until 1993, whereafter it levelled off until it reached another peak in 1998 of 26%. Thereafter a gradual decline followed. For purposes of what follows I assess the success of our labour market simply by the growth in jobs, rather than a static notion of unemployment, because. in South Africa we need massive job growth over the next decade and more. 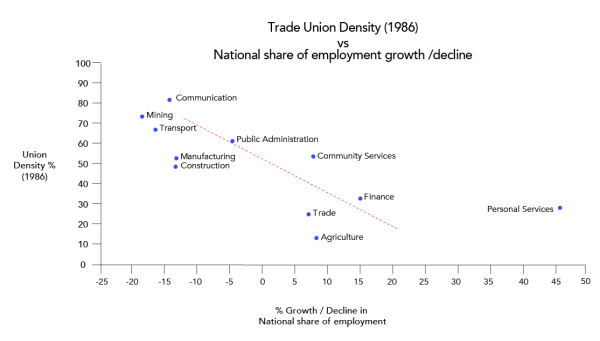 Is there any correlation between union density and the rate of growth or decline of employment over a period of time? In Graph 1 the block to the left of the vertical axis expresses union density as defined. On the right-hand side of the vertical axis is the graphic exposition of formal employment growth or decline from 1980-2004. 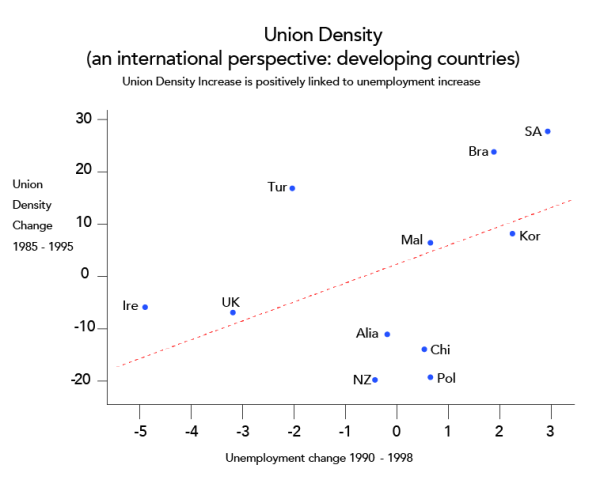 (Union density is a mirror image of the employment growth value, in that the left-hand axis counts from zero to 35 in a left-hand direction, whereas the right-hand axis counts from -4 to +6 in a right-hand direction). It is uncanny how closely these two curves run in parallel – in other words, as union density sharply increases from 1980 to 1993, there is a precipitous drop in the rate of employment growth. This growth starts off at a very positive and healthy clip of 5% to 6% in the early part of the eighties, but as union membership grows, it eventually declines to a rate of decline of between 2% and 3% in the early nineties. Thereafter union membership expressed as percentage of EAP reaches its zenith in 1998, namely 26%. It is at this point that the most dramatic shrinkage in the formal labour market actually also occurs. It is in that year that the growth rate of the formal employment market reaches the dismal figure of -4. Thereafter, as union membership expressed as percentage of EAP goes into gradual decline until 2004, there is a miraculous reversal of fortunes for growth in the employment market, which then for the first time reaches the same heights as were achieved in the very early days of the previous decade. Of course all this graph illustrates is that there is a correlation between union density and the growth rate of formal employment in this country. It does not necessarily mean that union density is what causes the growth rate to decline. It is at this point that it becomes important to remind ourselves that what we are measuring here as union density, is union membership expressed as a percentage of the economically active population, not as a percentage of the working population. 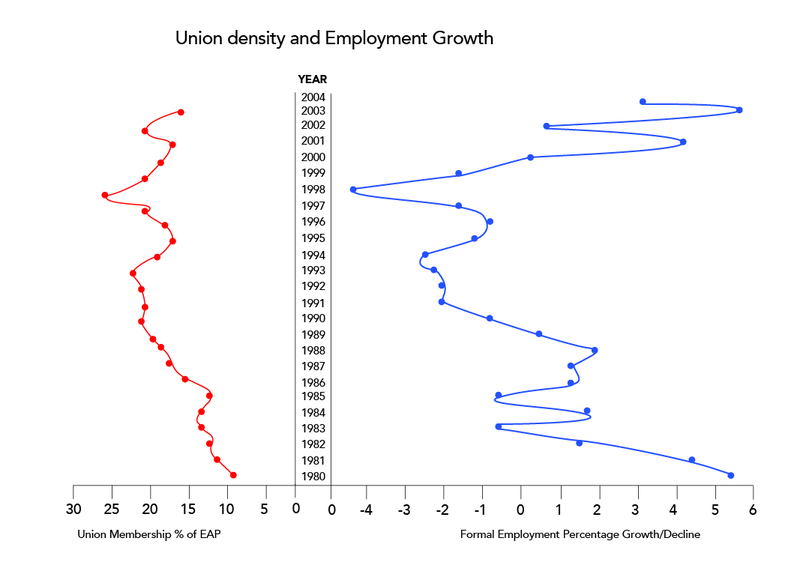 One argument that seeks to explain the correlation between union density and employment growth is that it is employment growth that causes a decline in union density, and employment decline that causes growth in union density. In other words, if there is a sudden spurt in employment growth, it takes a while for union membership to catch up, and as a result union membership expressed as a percentage of the employed will be lower. This argument is clearly wrong, as the figure that is used here is union membership expressed as a percentage of the economically active population. Because that figure includes all unemployed persons who want to work, growth in employment does not affect union density so expressed. The same applies to the converse argument, namely that because union employees have legal protection as a result of their union membership, they are less likely to be dismissed if retrenchments occur. That being so (so the argument goes), this will result in increased union density if retrenchments take place. 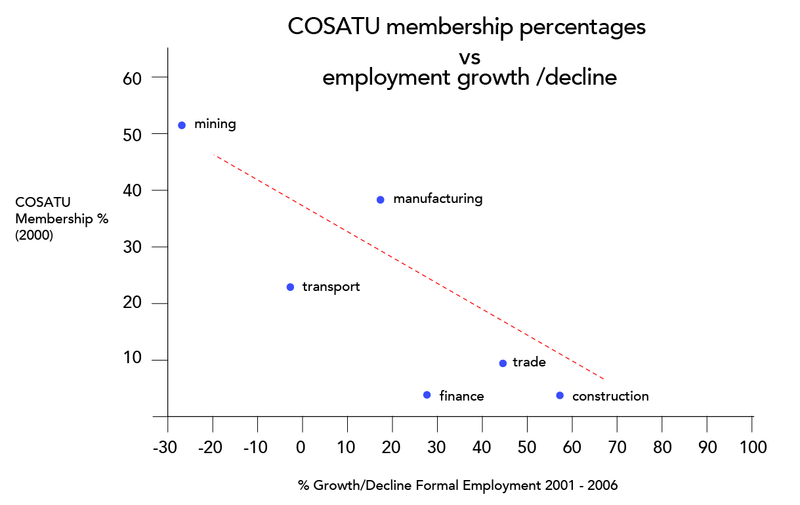 Again this is wrong, for the simple reason that, even if it were true that union members survive retrenchments in greater numbers, their membership in the measurement is still expressed as a percentage of the economically active population, which does not change as a result of the retrenchments. An examination of the curve of the economically active population shows a gradual incline over the years which does not fluctuate dramatically as do the union density and employment growth curves. 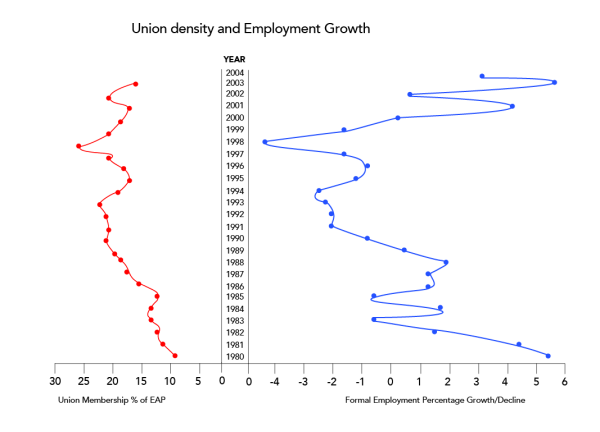 It therefore seems more and more likely that the explanation for the correlation between union density and employment growth is that it is the growth in union density that causes a decline in the rate of job growth. The relationship between high union density and sluggish job growth is not unique to South Africa. 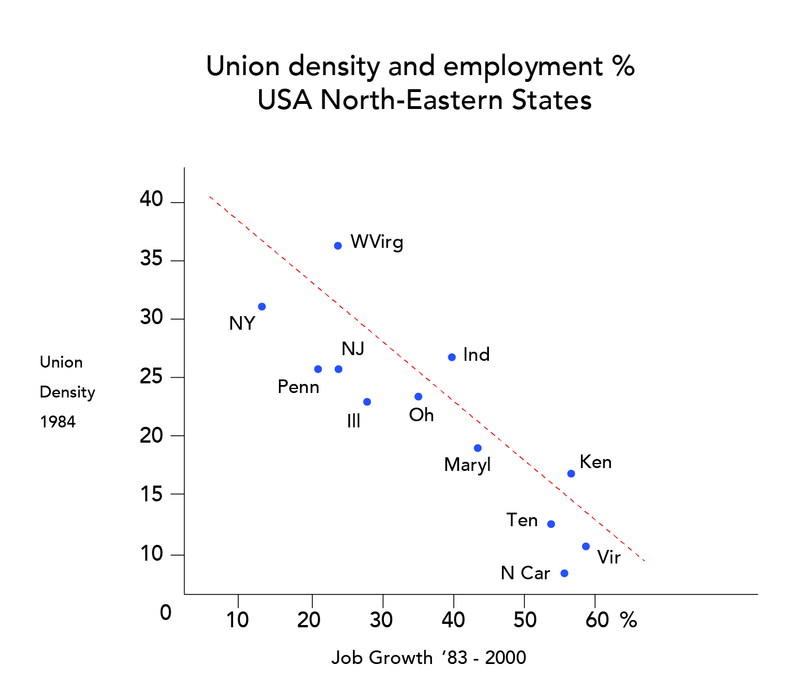 In order to test the same proposition that the employment growth is negatively influenced by growing union density, a number of American economists measured the correlation between union density and employment growth in a number of states in the USA, which they referred to as the “peer states of Pennsylvania”. These are states that lie in the north-east of the USA and are either bordering on or very close to Pennsylvania. Furthermore, they are used in economic comparisons as peer states of Pennsylvania for reasons of their similarity in type of economy, size, climate and so forth. Whereas they are not identical, they are economically similar in many ways. Where they differ quite sharply however, is in the relative degree of their union density and also in the relative degree of employment growth. In this exercise union density is expressed not as a percentage of the economically active population, but as a percentage of the total number of employed in each state. The various states cluster around a very clear curve. In states where the union density is high, such as New York with a density of some 32%, job growth over the relevant period is very low, namely 14%. On the other hand, in low density states such as Virginia with a union density of some 12%, job growth over the same period was almost 60%. The same pattern follows consistently for all the states. Another example which is worth noting in the Siebert study, is that of Ireland, where union density in the relevant period declined by approximately 12%, which correlates with a drop in unemployment of 5%. Another way of doing the same exercise is to divide South Africa into industries that are potentially sensitive to union density, and to compare their results. 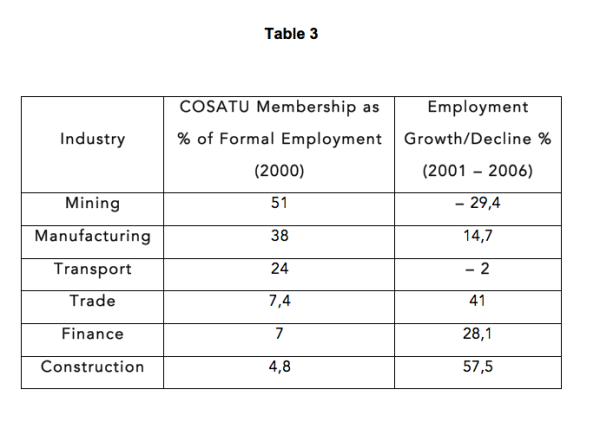 In Table 3 we compare COSATU membership expressed as a percentage of formal employment in 2000 with growth or decline of employment expressed as a percentage in 2001 to 2006. This is done in respect of the industries of mining, manufacturing, transport, trade, finance and construction. Again one accepts that this correlation does not necessarily mean that it is union density that causes low employment growth. 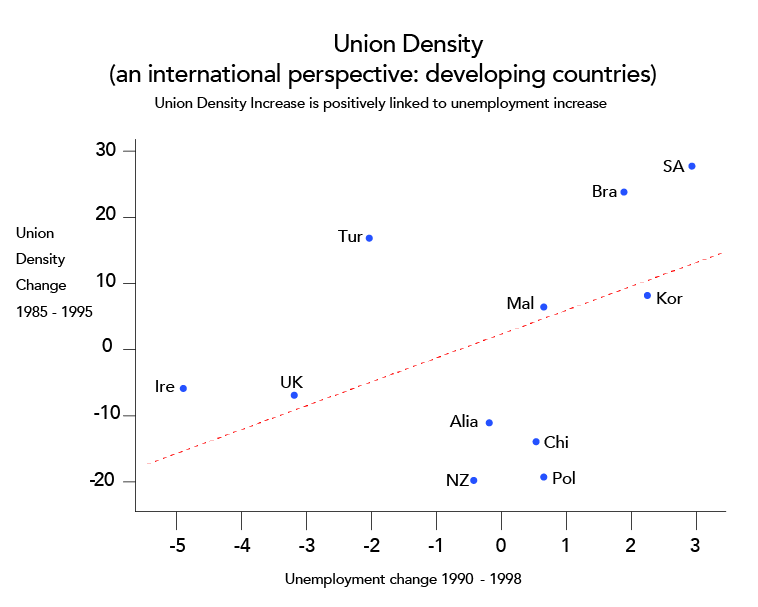 However, as we have seen in the discussion about the time-line comparison over the period 1980 to 2004, the explanation cannot be that union density is higher when employment shrinks, and vice versa. Another explanation must be found. In this regard, those who wish to get the trade unions off the hook may grasp at that old trustworthy, globalisation. The argument will go thus: because of globalisation, export industries such as mining and manufacturing are more sensitive to international competition (minerals, and manufactured products from China, etcetera) and as a result of upward pressure on the Rand (as the Rand increases in value, exports tend to decline). The next step in this argument is then to say that industries under pressure from globalisation tend to downsize (retrench) more, creating fertile recruitment grounds for trade unions. The first question is whether globalisation depresses growth, or whether it depresses employment growth as such. If it were so that globalisation was the explanation, then we would expect job creation or shrinkage to stand in a constant relationship to gross sectoral product (GSP) growth across all these industries. In other words, all industries will demonstrate employment growth that is equivalent to their GSP growth rates. We would thus expect the GSP growth / employment growth ratio to be the same or similar across all industries. What does this ratio in fact look like on an industry-by-industry basis? There is no comparison between these two groups. What is clear is that employment growth is not simply a function of economic growth. All of these industries demonstrated positive growth rates over the relevant period, but in the low-union industries employment grew faster than their respective GSP’s, whilst in the high-union industries there was effectively “jobless growth”.. This suggests that there is something other than merely low growth that impedes job creation. The above figures suggest that that something is union density. 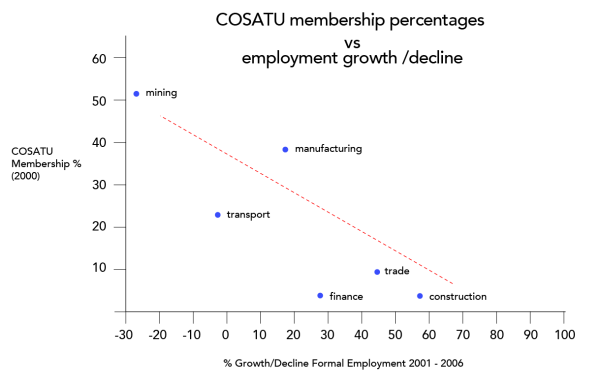 It is true that growth in manufacturing and mining is generally lower than in the other industries, but this is partly also the result of the fact that there is a disincentive on investment in employment in those industries. 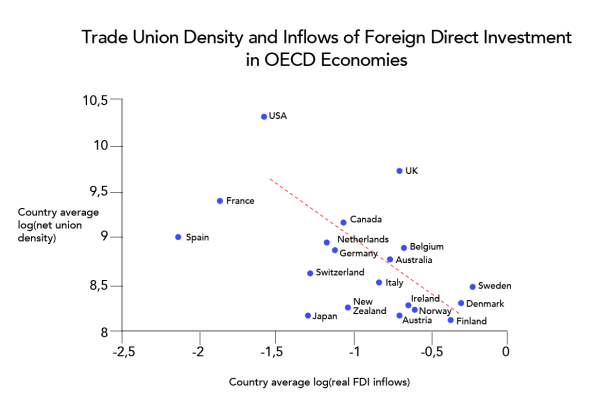 FDI is only one instance of investment, but one expects the same effect to apply to domestic investment, and thus job creation. A further difficulty with the globalisation argument is that transport is not sensitive to globalisation. If anything, transport will benefit from globalisation as it tends to lead to an increase in tourism and trade. Yet it is clear from the data that transport employment suffered, even though the GSP grew at a good rate. What it did have, was quite high union density of 24%. This points to the conclusion that it is not globalisation that causes retrenchments, which in turn causes high levels of unionisation. 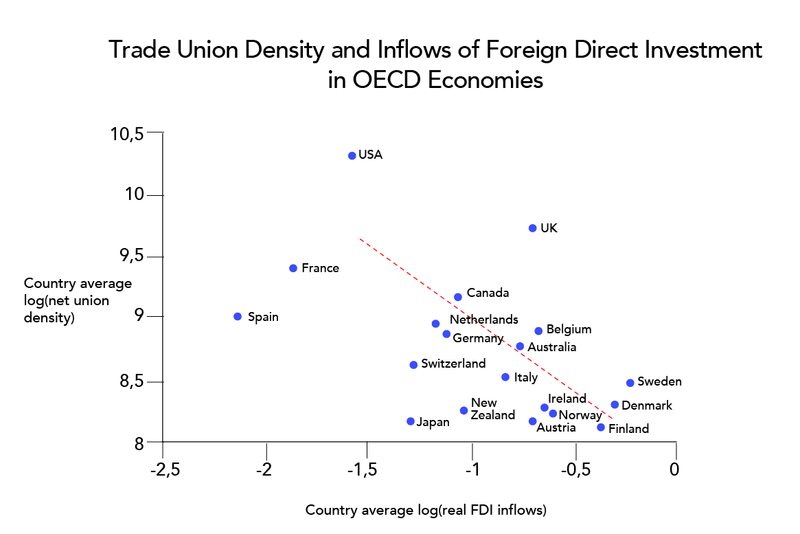 The contrary appears to be the correct explanation, namely that high union density deters investments, and particularly and disproportionately deters investment in labour. Finally on this point, it is significant that in the study of the Pennsylvania peer states and the 2000-2012 study above the trade union density was high at the outset of the period over which resultant employment growth was measured. That makes it much more difficult to argue that it was low employment growth that caused high union density. The same point can be made by reference to the position in Britain. In the decades up to 1980, union density in Britain relentlessly followed an upward curve. Then, as Margaret Thatcher’s Conservative government started a progressive series of stealthy reforms at that time which endured throughout most of the next decade, union density declined sharply. In the pre-Thatcher 20-year period the aggregate employment growth was 3.4%, and after the watershed of 1980 growth in the next two decades was 13.8%. If union density played any role, clearly this was caused by the drop in union density, rather than the other way around. In the first 4 years after 1980, British employment growth lagged, and only from about the middle of the decade did it start increasing. That suggests that it was union decline that caused job growth, rather than the other way around. In an independent study Woodon & Hawk re-examined the role of union density in employment growth in Australia. Unlike earlier studies done in Australia, the data used were from a panel of firms surveyed in both 1989 to 1990 and 1995, rather than a single cross-section of firms at a point in time. As a result, the study was able to control not just for the fixed characteristics of firms at workplaces, but also for changes in the economic environment and managerial strategy. As already pointed out above, the focus of this article falls on the private sector. For obvious reasons the government sector is not as sensitive to market pressures as the private sector. For example, the demand for teachers is determined by the number of schools and the number of learners that have to be educated, and there is very little competition where the government is the main employer. In the result pressure on wages, productivity, foreign direct investment and profitability are not problems that will trouble the state sector. It will simply go ahead and appoint as many teachers as are needed, no matter what the cost. In South Africa the numbers confirm this interpretation. Between 2000 and 2012 a quiet, insidious revolution took place in South Africa, in that government employment rose by approximately 46%, while private sector employment barely increased. The ratio of private to government workers changed from 5.5/1 to 3.9/1 over this period. Whilst private sector employment stagnated, government employment increased by 850 000 jobs. In other words, government employment is slowly but steadily crowding out private employment. Although over the same period union density of private sector employees declined from 26% to 20% (which would normally result in a surge in private employment) the only surge that occurred was in government employment. Not only did this occur in the teeth of a surge in union membership to about 70%, it occurred despite some 20% higher earnings growth in the government sector. Not surprisingly in the result the higher wages of the state sector are luring employable workers away from the private sector. State workers are notoriously unproductive, as their careers do not depend on profit as those of private sector workers do. The net effect is that scarce resources are re-allocated from a more productive to a less productive sector. This has also destroyed the beneficial effects of lower unionization in the private sector. What is equally concerning, is that all of this occurs at the taxpayer’s expense, which means that funds that could have been used to create wealth-creating private-sector jobs, now go to the ever-growing state burocracy. 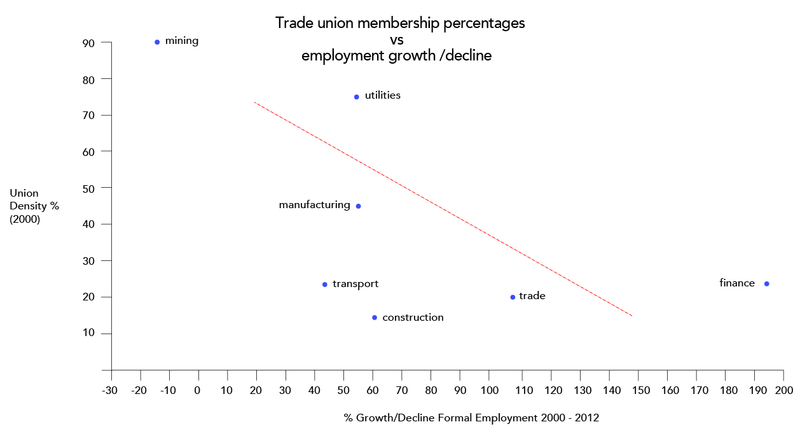 Why does high trade union density lead to a depression of the employment growth rate? The most conventional explanation is that the wage rate of unionised industries is artificially pushed up through the legal bargaining power of trade unions. This results in a new equilibrium point where the same demand curve yields lower employment as a result of the increased wages bargained by the trade unions. Another explanation for the same phenomenon is a variant of the first. According to this explanation, the wage curve of an industry is not simply the actual salaries paid to employees, but the total package of costs incurred by employers as a result of labour laws. These costs incurred include things such as time spent in disciplinary hearings and labour court cases, the appointment of human resource managers to manage labour law, legal costs paid to labour lawyers to advise companies, retrenchment costs, and similar impacts of labour law. Because trade unions are a focal point of labour laws, in that their very raison d’etre is to enforce rights granted to workers under labour law, they serve as a type of “magnifying glass” through which the impact of labour laws is magnified many times over. This serves as a disincentive to employers to create jobs in industries with high union density. A further and related explanation is that related to profitability. Because employment costs artificially increase as a result of the bargaining activities of trade unions, costs must either be passed on to the consumer or be absorbed by the business. Because businesses operate in a competitive environment, and also have to compete with foreign operations in a globalised market, many companies are driven to reduce their profitability. This in turn results in a reduction in investment in those businesses. Ultimately a reduction in investment leads to a reduction in employment. 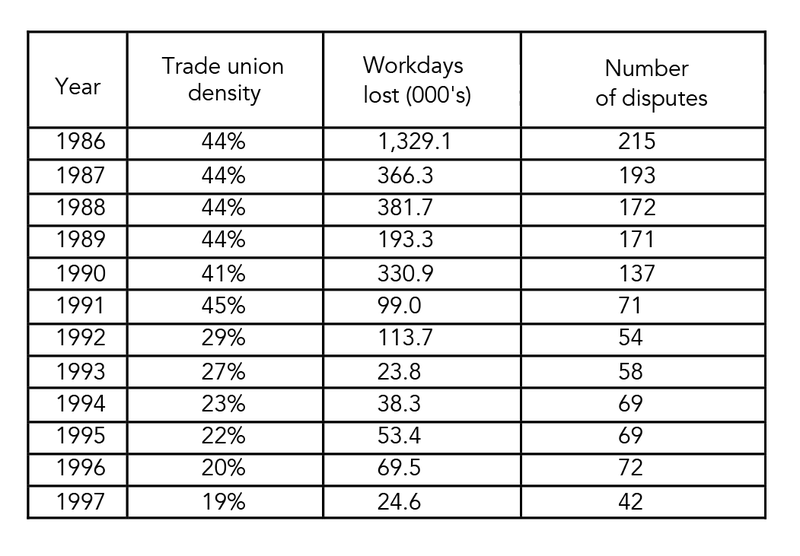 Trade union density also directly impacts on the number of work days lost due to strikes. In South Africa the agricultural strike in the Western Cape in 2012 was remarkable as it was the only major strike in years not called by a trade union. High strike rates obviously exact a cost, and thereby suppress job creation. It is important to appreciate that trade unions get their power from labour laws, in particular the Labour Relations Act, and that that Act enables the unions to a large degree to exercise monopoly power over the way in which employees in the workplace are represented. That in turn, has a cost implication. Power in this context is relative. The most extreme power wielded by a union is perhaps that of the closed shop. In terms of the Act a union can agree with an employer that the employees of that workplace must all belong to the union. Although the agreement may not require employees to belong to the union before becoming employed by the employer, the employee may be required to join the union as soon as he accepts the job. In fact, the Act further provides that it is not unfair to dismiss an employee for refusing to join the union, or for being expelled by the union. A variation on this theme is an agency shop, in terms of which the union may recover fees from non-members in exchange for the non-members sharing in the spoils of the collective bargaining performed by the union. A further variation of this theme is that non-members of unions may be bound by extensions of bargaining council agreements concluded between employers’ organisations and unions. The non-members have no choice in the matter, even if it means that the extension will have the result that they lose a job, or do not get a job in the first place, because they cannot command terms of employment that comply with the extended agreement’s terms. In the case of the bargaining council extension, by being compelled to accept terms and conditions of employment not necessarily demanded by them, at the risk of becoming or remaining unemployed as a result. In a way, all the laws that support trade unions in South Africa are variants on the theme of infringement of freedom of association. Because the law gives power to unions to populate workplaces and ultimately become majority representatives of the workers in the workplace, they are thus enabled to impose their will on non-members. By seeing union power for what it is, namely a form of closed shop (the difference case by case simply being a mere matter of degree) it is useful to study the effect of laws in other countries that infringe on non-member workers’ freedom of association, and determine how it impacts on employment growth. In the United States this type of infringement drew the attention of the legislature, with the result that it passed the Taft-Hartley Act, also known as the Right to Work Act, in 1947. In terms of this Act each State has the right to determine whether its employees may decide whether to belong to a trade union or not, and no closed shop may be imposed on them should the State choose the latter option, ie choosing what is described as right-to-work status. According to the Bureau of Economic Analysis, right-to-work states showed a 42.6 percent gain in total employment from 1990 to 2011, while non-right-to-work states showed gains of only 18.8 percent. According to the U.S. Census Bureau, population increased in right-to-work states by 39.8 percent and only 16.7 percent in non-right-to-work states from 1990 to 2011. According to the U.S. Census Bureau, 4.9 million people moved from non-right-to-work states to right-to-work states from 2000 to 2009. According to the Bureau of Economic Analysis, nominal personal income grew by 209.3 percent in right-to-work states and by 148.5 percent in non-right-to-work states from 1990 to 2011. For our purposes the most significant impact is on employment growth. The authors conclude that right-to-work states in the period 1970 to 2011 grew employment at a rate exceeding that of non-right-to-work states by 0.9% per year. It is also significant that, despite growing jobs roughly three times faster, right-to-work states do not sacrifice in terms of personal income. On the contrary, they gain in those terms too. Of course, we must bear in mind that the right-to-work states have far lower union density than the non-right–to-work states (8.83% as opposed to 15.59%). In terms of the evidence in this article, that alone may explain the superior job performance of the right-to-work states. The evidence from the US is convincing proof that legislation that favours high union density, such as that contained in our Labour Relations Act, is bound to enhance union growth and to deter employment growth in turn. Finally, there is also evidence that over the medium to longer term high union density significantly retards productivity growth. That obviously affects competitiveness and job creation. It does not really matter what the exact mechanism is by which higher trade union membership leads to slower or even negative job growth. For present purposes, it is enough to know that it is so. Each of these explanations probably represents an aspect of the truth, and in their own way they all contribute to the ultimate result. At a later stage, we look at ways and means that this problem can be tackled. For the time being, it is good enough to know that it is there; that trade union density is a major impediment to desperately needed employment growth in our country.